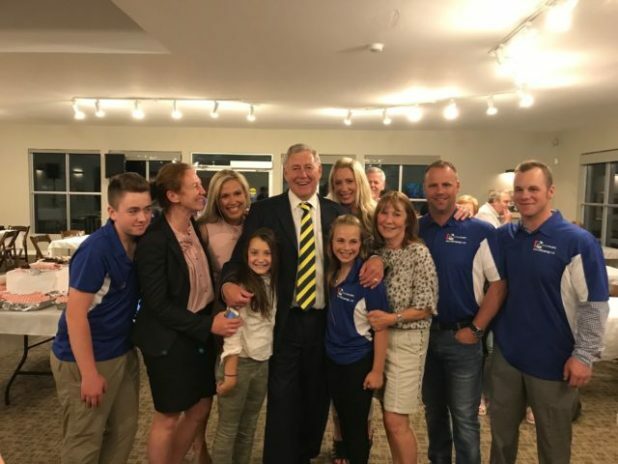 Ontario Progressive Conservative candidate Daryl Kramp has been elected as the first MPP of the area’s redivided provincial riding, Hastings-Lennox and Addington. In 93 polling stations across the riding, Kramp won all but seven. Each of those seven was in the riding’s far south. Each went to Ontario NDP candidate Nate Smelle, according to a Global News map of poll-by-poll results for each Ontario riding. “It was a clear resounding victory… I’m deeply, deeply appreciative that we got such a large turnout — disproportionately larger than you would ordinarily get in a provincial election,” said Kramp. The riding has a population of more than 94,000 people, 45,000 of which cast their votes in this election. “I think that was a clear indication of two things. Number one, people wanted change and, number two, we had an unbelievable team of volunteers from across the entire riding — that really made such a difference,” he said. As much as 50 per cent of the riding voted for Kramp, more than 22,500 votes. The runner-up was Smelle with 32 per cent, or 14,500 votes. Smelle congratulated Kramp on his campaign and said he learned a lot running his own campaign. It was Smelle’s first time vying for a provincial seat. “It was an incredibly enlightening experience and I am honoured to have had the opportunity to speak to so many people about the issues that matter most,” said Smelle noting he was grateful for his team and their hard work. Smelle said he was disappointed with how the vote went, but said most voters didn’t support Ontario PC leader Doug Ford. “From what we do know of the PC’s plan, it appears that the rich will continue to get richer while far too many people in Ontario continue to be deprived of affordable access to the basic necessities of life. I hope that I am wrong, but it seems that there are hard times ahead for communities like Bancroft, Coe Hill, Maynooth, and all rural Ontario for that matter,” he said. Ontario Liberal candidate Tim Rigby came in third this election with 11.5 per cent or a little more than 5,000 votes. “It is a hallmark of democratic countries that we have a peaceful and supportive change of power and I offer my support (and loyal opposition at times) to the new government,” he wrote. Sari Watson secured nearly 2,000 votes for the Green Party of Ontario in the area’s riding. Her party leader Mike Schreiner made history by winning in Guelph and securing the first Green seat in Ontario’s legislature. Trillium Party candidate Lonnie Herrington followed with 466 votes, and 362 votes went to Greg Scholfield of the Ontario Libertarian Party. “There’s been a real disconnect between… the Toronto circle of political influence and the people out in regions like ours. There’s been no communication and that just is not acceptable,” he said. Kramp has a long career in Canadian politics. He lost to Hastings-Lennox and Addington MP Mike Bossio in the 2015 federal election after two terms in the area’s federal seat. He was also a municipal councillor and deputy reeve in Madoc. Kramp congratulated the other riding candidates on their campaigns, saying it takes much to put your name forward for an election and that he admired the respect shared between the candidates. “As the winning candidate, obviously I’ll be responsive to the people who supported me, but also to the people that have a difference in opinion because it’s very important that we learn from one another and except the diversity that we do have in our region,” he said. Kramp said his next steps include building the riding from the ground up in terms of administration. He said there is “no infrastructure whatsoever” as it is a redivided riding.